It’s been over 2 years since my last blog post….2 years…. That’s quite a break from blogging and I’m not sure why my motivation disappeared. I could use the excuse of not having enough time between work (I’m now in my third year as an elementary Vice-Principal) and spending time with my family (I’m a married father of two daughters….with 2 guinea pigs…and a new puppy). However, as I sit in the waiting room of my daughters’ dance studio on a Saturday afternoon glued to my phone, I realise that I do have time. I’m just not using my time very effectively. After reading some of my earliest posts from 6 years ago, I’m finding that most of my motivation for blogging was more about writing about topics that other people would find interesting. I would spend days thinking about a topic and countless hours rewriting and editing until I thought my post was good enough for people to read but maybe I need to rethink my purpose for blogging and how I blog. Instead of blogging for others maybe I need to be a little selfish with my blog. So after a 2 year hiatus, I’m going to attempt to reignite the spark that I used to have for blogging. I have changed the URL for my blog from rothinks.wordpress.com to roflections.com and I will endeavour to make time to blog but I will keep it short and simple and most importantly meaningful for me. I read through a great article about engaging students in a dialogic stance in the classroom where the purpose of conversation is to help students improve their understanding of an idea, topic, or problem and push their thinking forward. However, although students frequently engage in social language exchanges, they do not necessarily have the natural ability to think aloud and share their ideas with others. Therefore, students need to be taught the protocols and guidelines of meaningful dialogue through modelling, teacher facilitation, and opportunities to practice. Consider partners/group members as sources of information. Be willing to reconsider your point of view after hearing others speak. Offer new ideas and possibilities. Build on what others are saying and offer support. Don’t make it personal when you disagree or challenge a comment. Be willing to clarify and explain your point of view. The SAMR Model, designed by Dr. Ruben R. Puentedura is used by many teachers, schools, and school boards. If you are unfamiliar with the SAMR model, below is a video segment of Ruben explaining the model that I clipped from a complete video in his channel. This simple yet power model looks at technology integration in education as a continuum and links how you integrate technology to student outcomes. As Puentedura explains, levels of integration range from substitution which can be useful but has limited impact on student outcomes to redefinition which can transform learning and has high impact on student outcomes. Technology is only as effective as how it is used and the tasks that our students are engaging in. 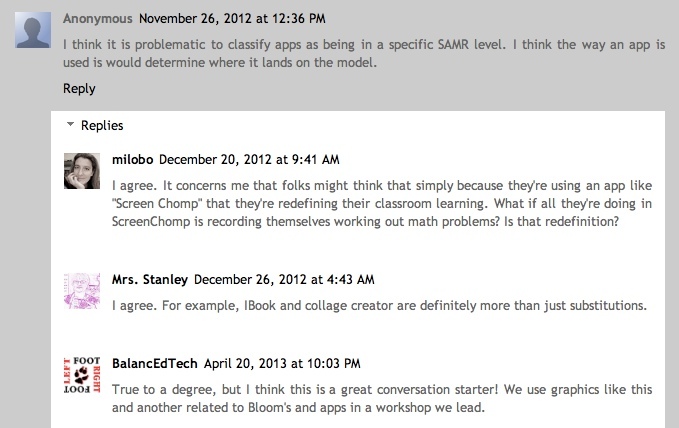 For example, screencasting apps like ScreenChomp or Explain Everything have great potential to redefine and transform learning but impact on student outcomes will be minimal if the app is used in a traditional, teacher centred way (teacher creating screencasts for students to view on the classroom iPad). What would you put in the four quadrants? 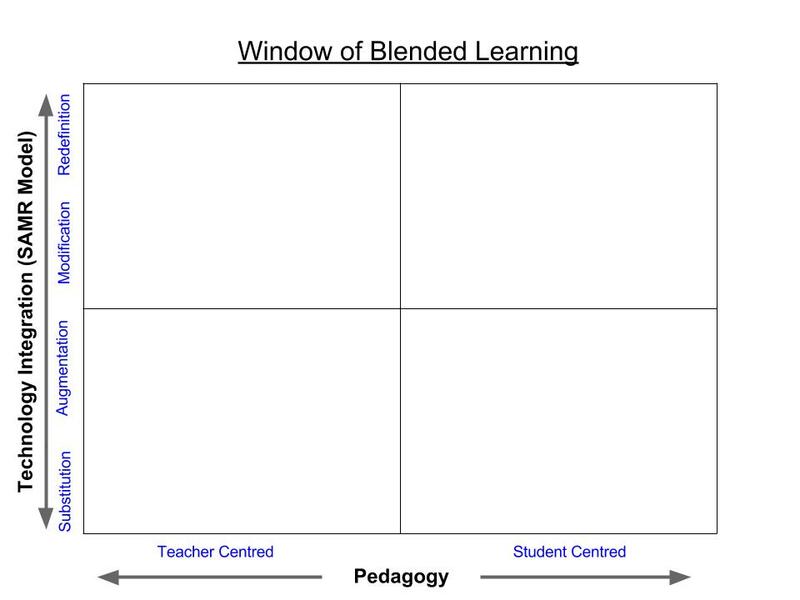 How would you use this Window of Blended Learning in your role? What would you change in this model? Update: There was a suggestion to post the Window of Blended Learning model that I created using a Google Presentation for others to add their thinking. So below is an embedded presentation of the model. Just click on “Google Drive” on bottom right corner to add your contributions. After further thought, I’m thinking that educators may want to use the Window in different ways. Perhaps some general descriptions of integrating technology or using it with a specific tool or apps. So instead of many people trying to add their perhaps different thinking to the same Window, I’ve duplicated the Window five times for now and if you have used the Window model at all, feel free to contribute your thinking to one of the slides. As more people share their use of the Window to the Google Presentation, it will show up in the embedded presentation below. Second Update: Based a comment from Aaron Puley, I’ve added some variations of the Window. I’m curious to know which one you would use. 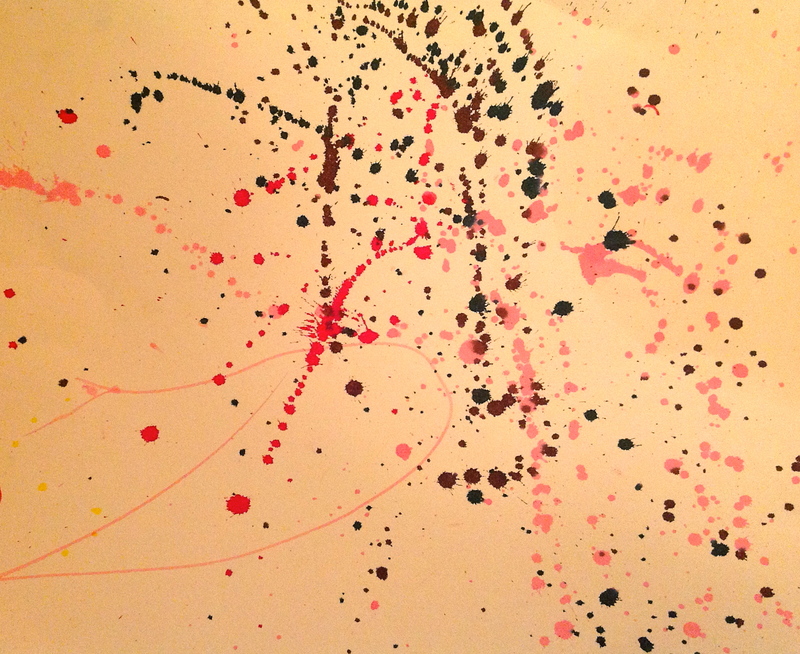 I was really impressed with the accidental art that she created and when I asked her about it, she called it “Splatter Splat” art. 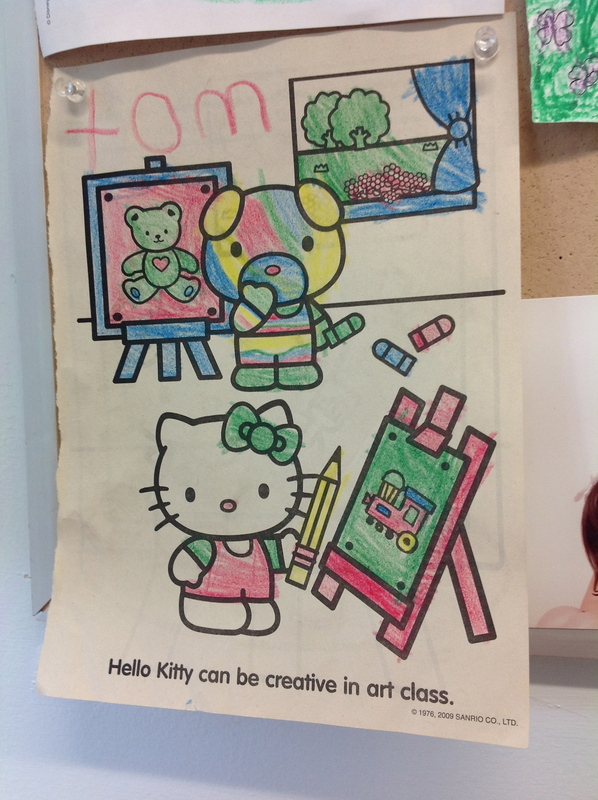 After we had a learning conversation about appropriate working conditions for this kind of art (i.e. 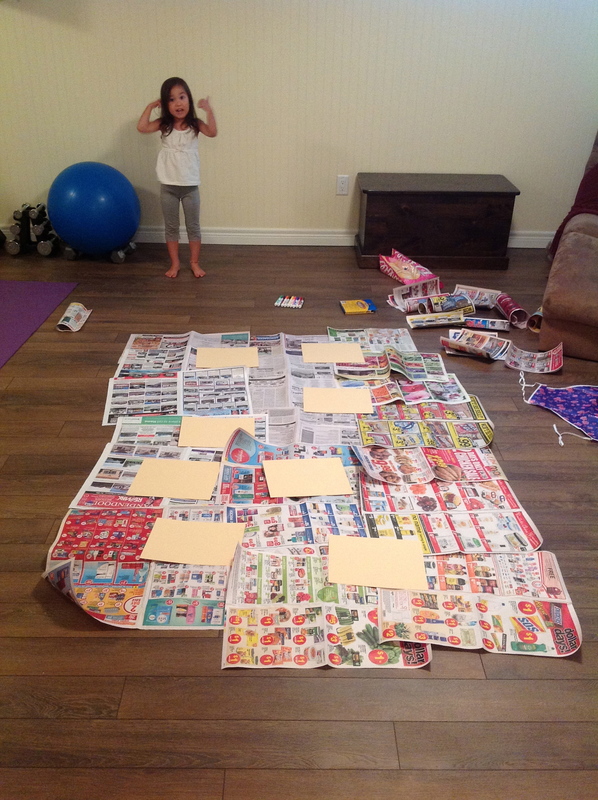 aprons and newspapers), I felt that I needed to provide her with a opportunity to extend her creativity a little further. Our creative session was amazing. Ava was engaged in a way that hadn’t seen before because the activity was centred around her discovery and she was an active partner in our art session. She’s coloured countless colouring pages where she was constantly reminded by adults to take her time and stay within the lines. However, this time she was the teacher and she taught me how to create the splatter effect technique. This experience made me reflect on the role of students in the classroom and how we respond to unexpected paths in their learning. Do we stay inside the lines of our program and our less plans funnelling back to the task at hand or do we think outside the lines of our program and work with the students and create the conditions for new learning? My art experience with Ava would suggest that thinking outside the lines can bring positive learning experiences for both students and teachers. So When, Where, Why and How Does the Technology Fit In? I’ve read many articles and blogs and I’ve heard many discussions debating the role and place that technology has in the classroom. Some argue that classrooms should reflect the 21st century world that our students live in which means allowing them to learn with 21st century tools and media. Others argue that these 21st century tools and media serve as distractions in the classrooms and take away from the learning. I thought I would join the conversation and offer my thoughts. I think it is important to differentiate between right drivers and wrong drivers and where that leaves technology. In Michael Fullan’s article titled, Choosing The Wrong Drivers For Whole System Reform, he states, “A ‘wrong driver’ is a deliberate policy force that has little chance of achieving the desired result, while a ‘right driver’ is one that ends up achieving better measurable results for students”. He argues that focusing on technology as a driver will not achieve the desired goal which according to Fullan is “the moral imperative of raising the bar (for all students) and closing the gap (for lower performing groups) relative to higher order skills and competencies required to be successful world citizens”. Therefore, the right driver should always be good pedagogy and in Ontario, I believe we are focusing on the right driver. The School Effectiveness Framework (SEF) is a K-12 support document that is aimed to help Ontario educators with school improvement planning with the focus on students achieving success. The SEF highlights six components of effective schools with indicators and evidence that help schools build coherence in their improvement plans. On page 9 of the SEF document, there is a diagram that explains how the province, district, and school support the instructional core. 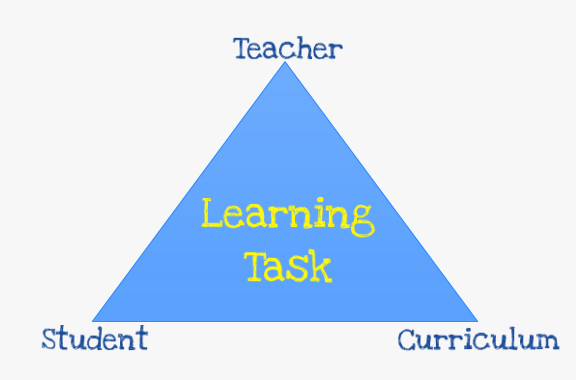 At the classroom level, the instructional core is represented by the triangle in the diagram below. This idea of the instructional core originates from a book titled, Instructional Rounds in Education by Elizabeth A. City, Richard F. Elmore, Sarah E. Fiarman, and Lee Teitel where the instructional core is described as the important relationship that exists between the teacher, the student and the content. The instructional core allows educators to focus on improving student learning by creating rich instructional tasks. However, in order to create rich learning tasks that foster higher order thinking and student engagement, all three vertices of the instructional core (teacher knowledge and skills, the role of the student in the learning, and the curriculum) must be considered. The instructional core is the focus in many schools and classrooms (as it should be) but what is often left out are the conditions that can enable this learning to occur and this is ultimately where technology is often left out of the learning conversation. If technology is focused on developing 21st century learning skills and the process of learning then it becomes more than just another medium, it becomes an important part of the learning conditions needed for students in today’s classroom. The diagram below illustrates some key components that make up the learning conditions (blended learning, 21st century learning skills, and technology). However, there is often a disconnection between the instructional core/rich learning tasks and technology. As I stated earlier, technology is often viewed as a distraction to schools focusing on the instructional core and that a rich learning task is engaging enough for students but in my opinion, technology as a learning condition cannot and should not be ignored. Michael Fullan best explains the relationship that should exist between technology and pedagogy, “The essential idea is to get the right learning embedded in the technology”. 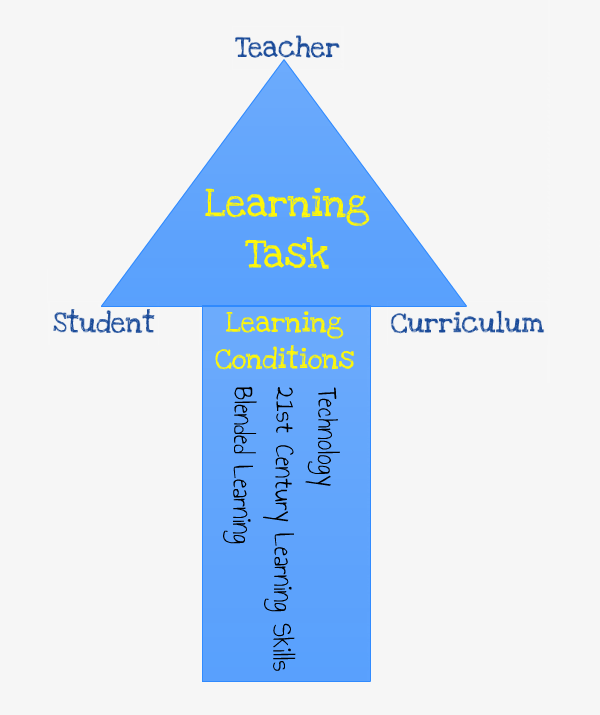 I made an addition to Elmore’s instructional core diagram below to illustrate that when you combine the learning conditions of technology, 21st century skills, and blended learning with the instructional core, you can increase, enhance, and bump UP any rich learning task. City, E. A., Elmore, R. F., Fiarman, S. E., & Teitel, L. (2009). Instructional rounds in education: A network approach to improving teaching and learning. Cambridge: Harvard Education Press. The other day, Ava grabbed her Russian dolls from the toy cupboard that she hadn’t played with in months. I guess the novelty of fitting the smaller dolls in the larger ones wore off and there was nothing else to learn about them. However, this time she decided to do something different with the dolls and she wanted to build a Russian doll tower using all of the pieces. Initially, she attempted to balance some of the flat bottom pieces on the rounded top pieces. This resulted in a lot crashing of pieces and failed attempts at building the tower, which led to a lot frustration. I left Ava to her own devices to figure things out and persevere with her self-directed activity. Thirty minutes later, I had a very proud daughter with her very own Russian doll tower (using all the pieces). Of course, I had to document this learning accomplishment and whipped out my iPhone to record. However, as I tried to get Ava to orally communicate her strategy, I found it very difficult not to explain it for her. Therefore in the video, you’ll hear me struggle with my questioning because I wanted Ava to explain her strategy without me giving her the words. I could’ve immediately praised Ava for turning the bottom pieces upside down to create a more stable and flat surface however, I wanted to her to make the connection and verbalize it. After watching the video, I wonder if I funnelled her to what I wanted her to say or if I worked with her as she explained. I would love to hear some feedback on this. I also didn’t expect Ava to ask me if I wanted her to make a different tower. This reminded me as a parent/educator to always set high expectations for our children and students and look for opportunities to extend their thinking. I was fully satisfied with Ava making one tower and didn’t even think to ask if she could build it in a different way (something I always encourage math teachers to ask their students).